This is a week for repeats here on FiftyFourAndAHalf.com. Sorry. But when I learned a little while ago that actor Omar Sharif died of a heart attack today, well, I thought I’d re-run this story, which isn’t mine, and which I love. It’s a story that was told to me by Omar Sharif. Sadly, it was in an interview on TV that I saw many years ago, and not in person. 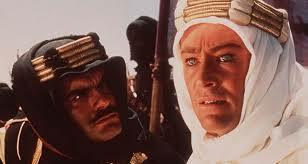 “‘I’m Peter, Peter O’Toole,’ he told me. “I’m Omar Sharif,” I responded reaching out to shake his hand. As the daughter, granddaughter and sister of Freds, I love this story. RIP, Fred. I hope you are off riding camels again with Peter. Loved Omar/Fred in Dr. Zhivago. My favorite role of his. As for Peter O’Toole? Loved him as King Henry in “Lion in Winter” with Katharine Hepburn. A must for any movie buff. I liked these two scamps! Thanks for reading. What a nice thought – both of them riding camels at a heavenly oasis. Thank you so much for these words. It is always touching when somebody can go out with a smile left behind. Your story made me smile while being sad, thank you. I’ve missed you. Thanks for weighing in. More on that another time. I do love your Fred story, although I have to tell you, with my memory, for a moment there, I mistook Fred for Duncan, and my heart clenched up a bit. I read “Goodbye Fred” and thought “Goodbye Duncan”, but thankfully, my eyes eventually caught up to my brain, or the other way around, and then I got to just sit back and enjoy what your shared. I can’t imagine a better story to share with the Fred’s in your life. Almost makes me wish I was related to someone named Fred. Well, we’re ALL probably related to someone named Fred, but you know what I meant. In a minute it’s going to not be Sunday anymore, so I just wanted to throw a wave in your direction. And I’m really hoping I get time to come back and explore some more. I haven’t been reading anything fun at all lately. One thing about being busy, it sure does leave less room for fun. I don’t know about you, but even though I still have a dog in my life, somehow or another, I still manage to forget that this is also supposed to be fun. Duncan is just fine. A scamp, but fine! I did a slide show of him a couple of posts back. Handsome devil. I hope you get back to having some more fun, too. And with me! I wasn’t as fond of Fred of Arabia, as I was of Dr. Zhivago. But Hollywood has certainly lost a legend. Interesting story and I loved reading the comments. I’m sure Peter and ‘Fred’ are upturning trains and raiding wells in the dessert… tremendous chemistry they had in that movie. Tremendous chemistry is right! They were wonderful, close friends all their lives. I read in the obit that they did a couple of other movies together, most notably The Night of the Generals,which sounds like it might be quite good. I’d never heard of it. Never heard of that one, and I’m a mad movie monster, will have to check it out. Actually, Omar Sharif wasn’t named “Omar”. His real name was Michel Demitri Chalhoub, according to Wikipedia. I read that in the obit. Wonder why he didn’t call himself Fred. Is it true that Omar Sharif didn’t like it when you rocked the Casbah? Ummmm, I don’t know. He was in a film by that name, though. It may have been his last as it was made in 2013. Am I being incredibly thick by not getting this? Rock the Casbah! Rock the Casbah! You’re not thick! I just made a silly pun, that went on longer than it should have. Well, sometimes I am thick. But really the prob is that I Google everything and found the movie he was in! Oy vey! Tee hee! one of my fave stories. Mine too. What a pair they made! Just like you and me. If we’d actually met, that is. I can empathize with Omar. ha! Some years ago, I joined a small dispatch office (three dispatchers an accountant and a VP). We were the long haul arm of a very large regional trucking company (5,000 employees) so we directed about 100 trucks scattered across North America. I was an addition and the original two were Peter and Paul. We spoke with drivers and customers and arranged times, equipment , loading, unloading, pricing, etc. It very very soon became obvious that having two Pauls in a three person office when all the business was done on the phone, was NOT going to work, Since I was the last one hired, they voted and decided I would have to change my name. they did kindly allow me to chose any name I wanted and since I rather fancied Phil, I became Phil for three years. Ha! There are still people out there who only know me as Phil. You would be surprised how easy it is to just change your name one day. You should have gone with “Mary,” Paul! They tried to get me to do that and I refused – Ha! Great tale to spread today, Elyse. Thank you! RIP, Fred. They were quite a pair, I think! The world is better for the gifts they gave us — wonderful films and lots of humor.